Eight months after a splintered and scams-tainted BJP handed it the state, the Congress in Karnataka has to go a lot far to get its act together for the Lok Sabha polls. From the peripheries, the Congress may appear to have a lot going for it this poll. It has not been in power in Karnataka long enough to risk any serious anti-incumbency. It had won both the by-polls to the Lok Sabha from the state on August 18, and has not hit a major scandal so far in contrast to the earlier BJP regime’s style. But a section of its state leaders say that a bigger worry for the party than the BJP closing ranks again in the state and the spectre of Narendra Modi factor at play is its own inner glitches and contradictions. Three months to the Lok Sabha poll, the party organisation and its government in Karnataka have yet to start moving convincingly together. The Karnataka Congress has been largely riding on the relatively clean image of its chief minister S Sidharamiah and the momentum from his initial populist pushes. But it has not helped that the state Congress president R. Parameshwara was a vocal contender for the chief minister’s job, until he lost in his own turf in the last Assembly poll. “Parameshwara has been looking for a senior ministerial berth, but the chief minister has resolved to keep him out. 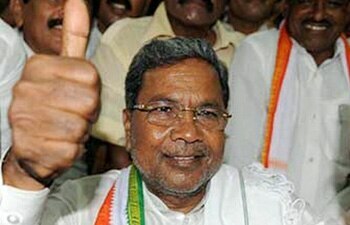 That is not a helpful situation,” says a senior Congress leader close to Sidharamaiah. “Several key leaders accommodated in the cabinet have not started getting around to galvanizing the workers. There have been few efforts so far to charge up the party, except for party president Sonia Gandhi’s rally in Bellary last week,” a Congress leader in Bangalore said. The KPCC’s shortlisting of candidates for the AICC’s review has also invited more than the usual share of rancour within party sections. Though the list retains all the sitting MPs, a section of its senior leaders say the list has candidates with “zero winnability”, in at least in nine constituencies. Dakshin Kannada, commanded by its senior stalwarts B. Janardhan Reddy and M. Veerappa Moily, is among the 16 constituencies (besides Bangalore north) Rahul Gandhi has picked for his primaries experiment in candidates selection. The party has been put at much embarrassment as the tussle for the ticket there between B. Janardhana Poojary and Moily’s son Harsha Moily is now in danger of spilling on to the streets. Even as some Congress leaders admit they could do with some local poster boys to spruce up the Lok Sabha campaign, former Infosys CEO Nandan Nilekani’s bid for a Congress ticket from Bangalore south was shot down by the state party unit. A senior leader said the AICC is almost certain to push him through in the final list, but that may not settle the dust. “That constituency may have a good section of the IT/BT crowd among voters, but its much larger chunk is rural. How can Nilekani, who is not a politician, or a bureaucrat or a known intellectual bring in all those other votes ? How will he relate and be accessible to our workers?” he asks. For Bellary, Sonia Gandhi’s erstwhile constituency, the KPCC list has proposed a lone name, N.Y. Hanumantappa, a retired judge in his eighties, who had lost the last assembly poll and has hardly any more political background. “If the AICC firms it, we will be giving away that seat without a fight this time,” claims a former Congress MLC. The party may not be fighting anti-incumbency, but it may not get much traction this poll from its government’s record either. Taking over from a self-destructed BJP had meant a baggage of high expectations on Sidharamaiah’s government. But apart from the Rs.10,500-crore package of sops for weaker sections and farmers that Sidharamaiah had announced soon after he assumed office, his government has made no spectacular difference so far. It had also lost some sheen and courted much anger within the party, when Sidharamiah inducted former Congress state unit working president D.K. Shivakumar and Roshan Baig, both facing corruption charges, which his supporters claim were at the AICC’s instance. Baig, who faces charges of land grabbing, had quit as a minister in the S.M. Krishna government in 2003 after he was linked to the Karim Telgi stamp paper scam. Shivakumar’s name was linked to illegal mining and land scams. Besides, some Congress leaders allege that their government has yet to do anything on its own to get to the bottom of the many scams from the BJP government’s time, except in cases where the Supreme Court had stepped in. Supporters of Sidharamaih, who holds his card as a Backward Caste leader close to him, claim that his pushing the AHINDA policy (Kannada acronym for proactive state schemes and support for SCs, STs, OBCs and minorities) may help take on the BJP’s support base largely made up of the upper castes. But others in the Congress apprehend this could also bring in a backlash at the LS poll from caste sections inclined to it, especially after the party had won them over in the last Assembly poll. Compounding this is the Congress government’s aborted bid to bring in a couple of legislations that angered the upper castes. One was the Karnataka Prevention of Superstitious Practices Bill seeking to penalise broadcast, propagation or promotion of any superstitious practices and another, to rein in the powerful religious mutts in the state. “Though the CM later declared neither would be brought in, the damage was done,” says a Congress source. Congress leaders have been officially playing down the recent return of B.S. Yedyurappa, the tallest leader of the dominant Lingayat caste who had propelled the BJP to a 19-seat haul in the 2009 Lok Sabha poll, to the BJP fold, but a senior leader admits that he could still play havoc with Congress prospects in several constituencies. “Yedyurappa may no longer be able to manipulate or buy out opponents as he did in 2008, but it was he who helped turn the tide away from the BJP for us in the last Assembly poll. It would not surprise if he gets anywhere from five to eight per cent votes more for the BJP in the Lok Sabha poll,” he admitted. Besides, a section of Congress leaders caution that the party’s sweep of the last Assembly elections need not carry it through the Lok Sabha poll. Karnataka had often refused to be a bellwether state, particularly after 1984 when the Janata Party’s Ramakrishna Hegde dissolved the state Assembly soon after the Congress swept the Lok Sabha poll that year in the post-Indira Gandhi sympathy wave. The snap Assembly poll six months later decimated the Congress, and Hegde’s party logged 139 Assembly seats, in place of the 90 earlier. The Lok Sabha poll may not be a make or break one for the Congress in Karnataka, but it is bound to be a pointer to where it is headed in the state where it dislodged the BJP from its only toehold in the south.